I love sports for many reasons. I love sports for the way it connects people. I love sports for the Buffalo Bills, the Buffalo Sabres… and I get to watch LeBron James play. I love sports because of the feelings that it gives me. Think about how few things in our lives can bring grown adults jumping to their feet and scream in pure joy. Think about how incredible it is to know that when a game is on, there’s a great chance you’re going to see someone at the absolute pinnacle of their profession perform to the highest level. Think about the drama of watching an important game involving one of your favorite teams with 30 seconds left, knowing it’s all on the line. You’re 30 seconds away from something incredible. It might be incredibly awesome, it might be incredibly terrible. But it’ll be incredible. And it’s with that passion that we bring you Hard Foul Sports. What started as a casual conversation with fellow co-founders Zach Snyder and Mike Tolsma, has blossomed into a podcast and a website with a writing staff, a growing sports brand with a bright bright future. I’m blessed to be able to work with some passionate, talented and incredible people that will work hard to bring you a great product. Now, I’ll be honest, I have no idea what the future will bring. But I do know a few things. We have a vision. We have passion. We’re just getting started. And the best is yet to come. Favorite teams: New York Giants, New York Yankees, University of Notre Dame (Football and Basketball), King James and his Court. I have had trivial pursuits all my life. Sports and pop culture have always taken precedent over “the important things” for me, and I’m cool with that. If that wasn’t the case, maybe I wouldn’t have cried after Mariano Rivera blew that World Series in ’01, and the Giants taking down the 18-0 Patriots probably wouldn’t be my favorite memory from high school. I’m in way too deep to try and take a step back from sports and view it all as “just a game”. Some hometown bias is bound to bleed through in my writing, but I do a pretty good job of taking off my pinstripe glasses and seeing things objectively. The main thing I bring to this site is genuine excitement and passion for sports. I have written for two other sports blogs, and just recently completed my Broadcast/Journalism education. I’m currently bartending while I’m working on my Sport Management degree and my coaching certification. I couldn’t be happier to be a part of the Hard Foul Sports team, and I look forward to sharing my hard takes with all you wonderful people. I am a true-blue sports elitist. I choose to root for winning teams, and I have no loyalty beyond the W. My favorite sports memories are definitely the 4 Red Wings, 3 Red Sox, 5 Lakers, 4 Patriots, 1 Rams and 5 Yankees Championships that I have been lucky enough to watch my teams win (22 total!). I am well-rounded in my sports viewership and will be writing in a variety of different areas. I am also a 2014 graduate of SUNY Brockport (Go Eagles), with a degree in having a good time. I believe that I will be bringing intelligent analysis, as well as an in-your-face attitude that is sure to please some and infuriate others. I am glad to be a part of the Hard Foul team and look forward to providing quality content for you, the reader. My favourite sports memory is beating Evan on NCAA Football 10 with a last second hail mary. I write about the beautiful game with 15 years of first hand experience, being born and raised in Scotland (Rangers, not Celtic). Graduating from Syracuse, I learned to love football and basketball, but I’m a slow learner. Read me on the Premier League, the tactical evolution of soccer, and anything else that’s interesting on any given Sunday. 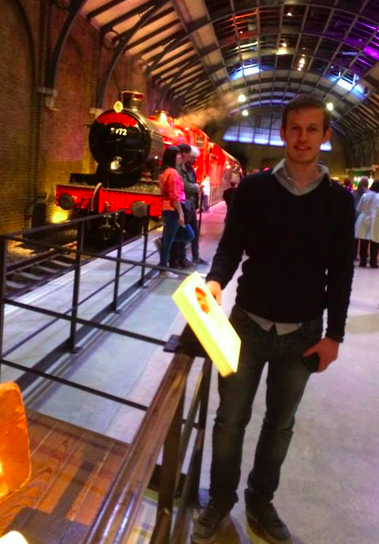 Oh and yeah, that’s me with the Hogwarts Express. Deal with it. I realized how much I liked sports when I picked up a basketball for the first time as a tall, skinny junior in high school. I realized how much I loved sports spending 14+ years playing competitive hockey. I realized sports was my life and passion after spending four years as college baseball player. Everyday for four years the end game was the same – be a winner and get better everyday. That all came to fruition raising a Metro Atlantic Championship in 2013 and playing in my first, and only NCAA tournament in Chapel Hill against the #1 team in the land, the University of North Carolina as a college junior. Hard Foul Sports was nothing more than friends sitting down and talking about how cool it would be to have a podcast. Today, the end game – is to be better tomorrow than we were today. I love sports, I live for the highs and the lows. Most importantly, I love reaction. Discussing sports is enjoyable. My content will be all over the place. From the Buffalo Bills to the PGA tour there is not one area of the sports world I will not be open to discuss. Our team is already growing with eager young minds like myself. Join the Hard Foul Sports team and follow us on our journey – we won’t disappoint. Sports have always been my number one hobby, whether it be playing or watching them, I love all things sports. By writing for Hard Foul Sports, I hope to improve my knowledge of the core four sports. I see myself writing about the Bills and the NFL, the Sabres, NBA, and even some MLB. Hopefully I have some interesting “hot takes” and hopefully you’ll enjoy what I have to say! Favorite teams: Buffalo Bills, Buffalo Sabres, Atlanta BravesI am a lifelong sports fan with an affinity for choosing the wrong team. As a Bills, Braves and Sabres fan, I have felt more heartbreak than anyone should with something as wonderful as sports fandom. Overall I consider myself a huge fan of baseball, and I am a self-proclaimed stats nerd. The history of baseball is unlike that of any other sport, and it’s amazing to see the evolution from the dead ball era to the modern game. I believe that the math involved in the game of baseball is part of what makes it beautiful, and I will try my best to present facts that are unbiased. However, I certainly have no problem voicing my opinions, including the inevitable hot takes. I look forward to bringing my interest in sports, specifically baseball, to this platform and sharing it with anyone willing to read. After hearing that Mike, Zach, and Evan were starting Hard Foul Sports, I immediately began itching at the idea of joining in, one aspect or another. I am extremely pleased with this opportunity, and I hope that I can bring something useful to this website. Thank you for reading, and thank you for supporting Hard Foul Sports! My favorite sports memory is the Red Sox rallying from 3-0 to beat the Yankees in the ALCS, and going on to winning the ’04 World Series. A sports goal of mine is to visit every NFL stadium. I plan on sharing with you my takes on the Buffalo Bills, NBA news, along with some sports takes that I just absolutely have to get off my chest. I have the hottest takes north of the Mason Dixon line. Hope you can handle them! Music major. I have a large background in sound recording, as well as performing. Your everyday Buffalo sports fan, who had a chance to become a part of something we never though would actually come to where it is today. Thank you Hard Foul Sports. Avid weightlifter. I just want to thank Mike, Evan, and Zach for the chance to record and edit you guys. Every week brings new knowledge, and that’s something I was looking forward to when joining the team. The sky is the limit now. My interest and following in sports has its distinction from the “National Leader of Sports”. As a resident of Western New York, I know myself and the surrounding population to live and maintain attention to a different agenda. Buffalo’s mass interest and support for Ice Hockey can be attributed to its close proximity to the Northern Borders. Evidence of this can be found on a 15 degree day in the revamped Outer Harbor located downtown. The ice skating, the curling lessons and the four seasons provide a strong case against Minnesota for the title of most Canadian city located in the United States. My participation in athletics ranges from time as a high school lacrosse goaltender, pickup hockey on the pond, to a lengthy 18 holes in Akron, NY. I am pleased with the opportunity to be a part of a group of writers who seldom fear any opportunity to take a strong stance. My passion for the city I call home has been shaped by the food, the neighbors, the up-hill path to recognition and the two “minor” Buffalo championships I have witnessed in person. My most memorable sports moment took place at the Quicken Loans Arena when the Buffalo Bulls punched their ticket for the 2015 NCAA March Madness Tournament. The future of my career has a distinct tie to professional sports. I aim to progress and grow alongside Hard Foul Sports. Sports have always filled my free time since I was a little kid. Growing up playing football, basketball, golf and soccer, I quickly developed an appreciation for what sports represent in society. Growing up in Buffalo, I didn’t have much of an idea what winning felt like, but that strangely didn’t seem to matter. I loved everything about the Bills, Sabres and Bulls, regardless of the outcome on the field. This lack of success is precisely how I know sports is my passion, because I love everything about it, even though it doesn’t fall my way most of the time. I can’t begin to imagine what my passion will be like once my Buffalo teams start winning, and that’s the most exciting part of every year. “This is our year” is a yearly sentiment that resonates throughout the fan bases, reenergizing me year after year. Thus far, my happiest sports moment came in spring of 2014 when the UB Bulls basketball team won the MAC Tournament and made their first ever NCAA Tournament appearance, before losing a close game to West Virginia. I was lucky enough to have followed the team throughout the season, attending nearly every game, which makes it all the more satisfying. I look forward to what the future of professional and collegiate sports holds, and I’ll be here to share my opinions through all of it as a proud member of the Hard Foul Sports team. Following a web search on Buffalo Bills updates,came across your website..just wanted to say I have spent the last hour reading some fantastic articles and opinion on the Bills and Im hooked! Great work,great layout and Hardware Foul Sports is now bookmarked..keep up the great work!! Hey thanks for reading and we’re thrilled you love our site!